Para DITM Acoustic Direct Box & Preamp with 5-band EQ. 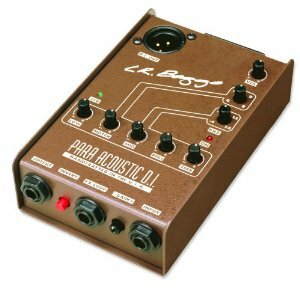 Para DI Acoustic Guitar PreampDue to its studio quality performance, powerful tone shaping EQ and rock-solid reliability, the Para DI has become an indispensable stage tool for countless musicians around the world. This roadworthy box effortlessly tames the stage and enhances any acoustic pickup for a fuller, more complex sound. The Para DI features a 5-band EQ with a tunable midrange and notch, variable gain control for passive or active pickups and a high-quality DI output for a pristine signal to the board.Para DI - Acoustic Guitar Gold Award. FEATURES: Adjustable gain for both passive and active pickups. 5 band EQ with tunable notch and midrange bands. Phase inversion for best sound and feedback control XLR and 1/4" outputs. Works with 9V battery or 48V phantom power.